iPhone apps: Losing users within 30 days? 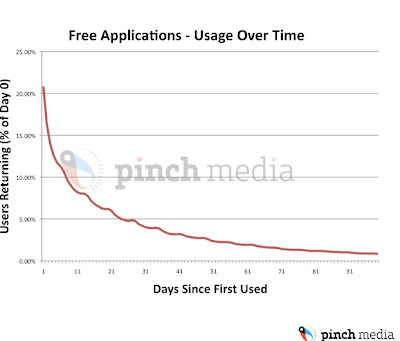 Speaking of iPhone apps, Pinch Media recently tracked 30 million application downloads and found a startling fall-off among users. Apple has had more than 1 billion of these tiny software launch buttons downloaded to iPhones, but it turns out most users quickly forget about them. Pinch Media found that only 20% of people continue to use a free application after the first day, and three months after the download fewer than 1% of users continue to tap the app. This doesn’t bode well for companies hoping to profit from advertising run on free apps — ads on iPhone apps run $0.50 to $2.00 CPM (cost per thousand impressions), and Pinch estimates that with only 80 average sessions per user, application makers would have to charge at least $8.75 CPM to break even. To be fair, iPhone apps likely follow a classic Pareto skew where a handful — news, weather, maps — get used far more than others. Or perhaps iPhones were made for calling people after all.